There’s no denying that life science company explainer videos are powerful marketing tools. These short videos (typically found on the homepage of a company website) communicate the specific problem your company can solve, and highlights the process you use to do it. So instead of great big wall of text, site visitors are instead treated to the most powerful call-to-action on the web: a play button. Since life science company explainer videos are often front and center on our company’s digital front door, they must be created with the right approach or else your company risks wasting precious marketing dollars on a terrific-looking video that doesn’t serve your audiences, and doesn’t have an ROI. So before you make any decisions about your life science company explainer videos, make sure you understand your audience. Only by starting with your audience will your explainer video be guided by the right compass. Focus on the audience for your Life Science company explainer videos. These days, prospects are busy, and only getting busier. They need answers at their fingertips the moment they think of the question. If a single second of your video doesn’t engage them, they have every right to stop watching and find their answers elsewhere. Regurgitating large blocks of text from your website’s Service Page in a company explainer video just won’t work. As Life Science marketers, we must be strategic and selective about the information we share in our life science company explainer videos to keep our prospects engaged. The question is: What information should be included? With many Life Science companies each offering hundreds if not thousands of services across a broad array of service industries, the choice can feel paralyzing. Thankfully, the key is relatively simple. 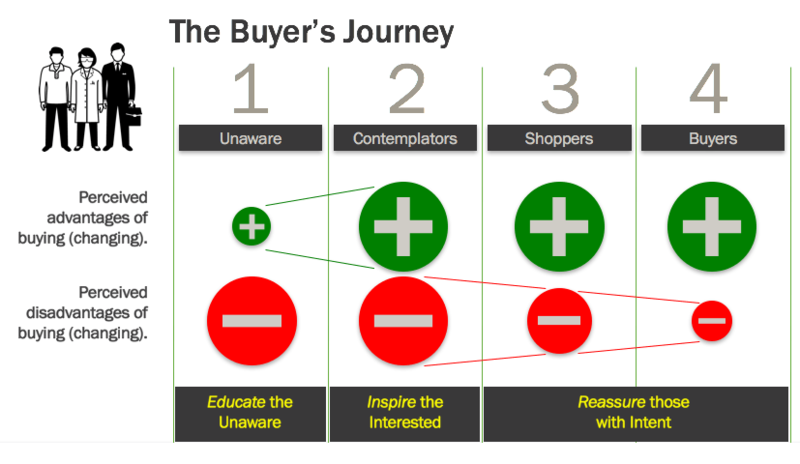 Think deeply about the journey your prospects take as they become buyers. The diagram below showcases the different stages of the buying cycle. Your company explainer video should inspire those who are actively seeking a solution for a problem they are trying to solve, who are interested in buying. These prospects are called Contemplators. The Buying Cycle. Buying in the life sciences proceeds in four stages. In the first, prospects perceive the disadvantages of changing as much larger than the advantages, so non-sales-focused education is needed. Inspiration is then needed to increase the perception of the advantages of changing (stage 2). In the last two stages, the perceived disadvantages must be reduced through reassurance. Contemplators should be the primary focus of your life science company explainer videos. While Contemplators will need to be educated on what your life science company does, your life science company explainer videos must do more than just check the service boxes. It must inspire. It should demonstrate how you thoroughly you understand the seriousness of your prospect’s problem, and then show them that you are the light at the end of the tunnel—the inevitable answer they have been seeking all along. With that goal in mind, review your company explainer video against the following criteria. Focusing on just one message. Since life science company explainer videos can be a heavy time and capital investment, it makes sense that many marketing directors aim to get as much bang for their buck when creating each video. But cramming several different points into one video can ruin one great video by trying to make it do the job of several. Instead, use your life science company explainer videos for one thing: positioning your organization’s unique value as the best answer to the problems your prospects are trying to solve. Deep dives into superfluous details about your organization’s new Flow Cytometer or experienced Medical Writing department should be reserved for other videos (videos aimed at Shoppers who require reassurance). Prospects watching your company explainer video don’t need and don’t want to see that information just yet. Other companies have great technology, and experienced teams too. Focus on what sets you apart, on what makes you truly unique. Choosing language your audience can understand. As your life science company explainer videos plays, inspect the language in the voiceover and titles. But don’t interpret them as yourself. Instead, absorb them as your audience would. Ask yourself: is it too scientifically advanced, or alternatively, is it too basic? If your prospect would understand the words like hygroscopicity or amorphous dispersions, that’s great, include it. But if not, and your prospects start searching for their dictionary, you have prioritized appearing smart over landing your next customer. It’s your job to make sure that your audience understands you, not the other way around. Using a style that matches your message. There are many ways to get a message across in life science video marketing. You can use animated graphics, live footage from your laboratories, selfie videos from your staff, or perhaps Tim from Medical Writing who happens to be hilarious. The right approach is the one that most effectively aligns with your archetype and clearly communicates your unique value. For example, if you are a clinical research organization whose organization is aligned around the Sage archetype and your unique value is a complex process that needs to be communicated clearly, opt for the animated graphic over a humorous live-action video with clever punchlines. Since the Sage archetype represents clarity of thought (among other attributes), your video will more consistent with animated graphics. Alternatively, if you are a medical device company whose organization is aligned around the Jester archetype, make good use of the comedic talent in your office. This is the moment for hilarious Tim to shine. Avoid defaulting to a video style because you have either A) used it before or B) think it’s just easier to do. life science company explainer videos are worth the investment when done right, and not worth the headache when done incorrectly. Aligning your voiceover and imagery. When done correctly, the shots in your life science company explainer videos should work with the voiceover. There should be a certain poetry in the way each of these elements empowers and clarifies the other. Combined with the use of appropriate music, your video can stir emotions deep within the mind of your prospect. However, any misalignment between your voiceover and the shots in your video will puzzle your prospects. For example, if you’re a contract research organization whose life science company explainer video’s voiceover is explaining the importance of having a team capable of large scale development, but it plays over the shot of stock footage of one scientist in a lab, then you are actively confusing your prospects. Prospects naturally want to find a connection between what they’re hearing and what they’re seeing, but the harder they have to work to find it, the less engaged they will be. Using a call-to-action that fits your distribution point. I have lost count of how many times I’ve watched a life science company explainer video on a home page only to be told (at the end of the video) that I should visit the website for more information. I’m already on the website, tell me what to do next. Said another way: Your prospects are trying to give you money, make it easy for them. Side note: The concern I have when seeing a misused call-to-action is that the company did not plan how they wanted their audience to behave after watching the video. Again, life science company explainer videos are an investment, and the ROI depends entirely on how strategically you execute them. 11 points: You’re doing great! Your prospects are likely enjoying your life science company explainer video and walking away inspired and aware of what your life science company has to offer. 7 – 9 points: You’re doing pretty good, but note specific areas of improvement for the next life science company explainer video your team creates. 6 points or less: Remove the life science company explainer video from your homepage. It’s doing more harm than good. Maybe you can tweak the video, but it probably needs to be redone. Life science company explainer videos can be highly effective ways to properly introduce yourself to prospects—if they are developed with your audience’s needs considered first. By thinking strategically about the information your prospects need to see, you greatly increase the chances that your play button will lead to your next new customer.